This is irresistible movie material: the lead-up to the wire-walk has all the elements of a heist, with Petit (here played by an elfin Joseph Gordon-Levitt with a thick French accent) as the fearless or at least highly determined leader of a loosely assembled group. The fun here is that so many things could go wrong for Petit’s plan at any moment — and things, in fact, sometimes do go wrong in ways both expected and unexpected — but it’s in what goes right for our hero that “The Walk” finds both its spine and its heart. Levitt narrates this movie directly to the camera from an aerie in the Statue of Liberty’s torch with the Twin Towers directly behind him, as if this space up in the air were his hard-won territory. The weakest parts of the movie are the early scenes in France, where we see Petit honing his skills as a street performer and picking up girlfriend Annie (Charlotte Le Bon), who is first glimpsed singing Leonard Cohen’s “Suzanne.” The dialogue in these courtship scenes is old-fashioned boilerplate (“You don’t give up, do you?” Annie asks him at one point as he keeps pressing his suit), but that lack of specificity retroactively feels intentional as the film goes on. Those French scenes in “The Walk” are done in that sanitized and vaguely creepy visual style that has been a hallmark of Zemeckis’s animated work in recent years, complete with color elements popping out of a black-and-white frame. The visual unreality continues when Petit is up on the wire learning his craft, but Zemeckis keeps a steady, smart, and gently humane focus on the people in his story; once the plot moves to New York, the effects begin to improve dramatically. 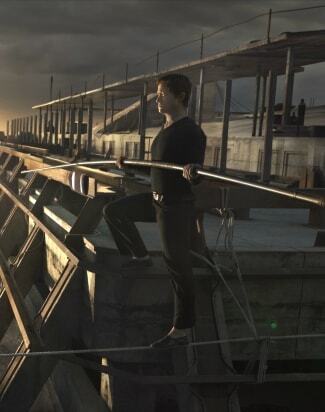 What’s fascinating about “The Walk” is that the 3-D puts you out on a limb with Petit while it also reassures you that this is just a movie, or an act, or a performance. The results are often scary (don’t be surprised if your palms sweat for him) but the camerawork remains as impressively levelheaded as Petit had to be during his walk. “Take the first three steps arrogantly, as if you were invincible, and you will die,” says Petit’s mentor Papa Rudy (Ben Kingsley), a man who holds a cigarette in a holder and gives much sage and fatherly advice. There’s a beautifully acted scene here where Kingsley’s Papa Rudy stares directly and lovingly at Petit and lets him know that, while he doesn’t quite understand why Petit needs to take the risk of doing this clandestine Twin Towers wire-walk, he understands it in his heart. This brief interaction is just one of several intimate personal moments in “The Walk” that make it more than just the story of a male adventurer and his adventure. Perhaps the film’s deepest bond is the relationship that develops between Petit and Jean-Francois (César Domboy), a math teacher with a serious fear of heights. At one point, Petit and Jean-Francois (who asks Petit to call him Jeff) are stuck for a very long time on an iron beam above an elevator shaft with a sheer drop down to the ground. It has been established that Jeff is so afraid of heights that he begins to shake when they are standing just one flight above the lobby of the South Tower, so it really means something when Petit looks Jeff straight in the eyes and Zemeckis cuts to a close shot of Petit putting his hand on Jeff’s trembling hand to steady him. It’s a simple sequence that nonetheless conveys a touching level of trust and intimacy. In the final hours before the walk, Annie is grounded at street level with her binoculars, seemingly out of the adventure, and Zemeckis calls attention to her exclusion in a way that directors of movies like this seldom do. Jean-Pierre (James Badge Dale), a New York shop worker whose gift of gab has been a key element in sneaking Petit into the towers, sees Annie down on the street and says to her, “I wonder if he even knows you’re down here.” At first, it might seem like Jean-Pierre is hitting on her, but he’s actually just pointing something out that she seems to already know. There are many enjoyable close calls and head-shaking details in this story, like the fact that Petit went ahead with the walk even though he had stepped on a nail a few weeks earlier. (The moment when we see his foot stepping through the nail here is maybe the most realistically and harrowingly three-dimensional in the film.) The walk itself is presented in as exciting and detailed a fashion as could be wished, to the point where it becomes a rare mystical experience. The way that Jeff overcomes his extreme fear of heights to be Petit’s key point man is so sensitively and believably drawn here that it feels genuinely inspirational and heartwarming. But Zemeckis insists also on showing the human cost of the adventure, in Petit’s ultimate isolation from everyone around him so that he can be up in the clouds. When Zemeckis decides to pull on the heartstrings, he manages to do it without offending the more hardboiled among us, with some tact, grace and human understanding. 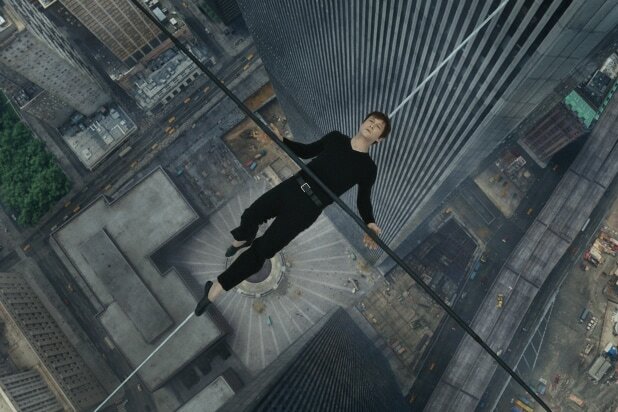 “The Walk” is that rare movie that might please practically everyone, from viewers just looking for a thrill to those who might enjoy a story that sounds like a tall tale but winds up being discreetly poignant.